It is one of the most common illnesses from eating seafood, sickening more than 50,000 people a year, and it is on the rise around the world. Yet most people in the United States have never heard of it: ciguatera fish poisoning. Ciguatera produces a variety of unpleasant symptoms, including vomiting, diarrhea, numbness, breathing difficulties, and bizarre reverse sensations of heat and cold. Recovery can take years. There is no reliable way to detect whether a fish has ciguatera poison without using elaborate toxin extraction methods and complex analytical instruments. In some places, people have tried using cats or other animals to test food, but this is far from reliable. 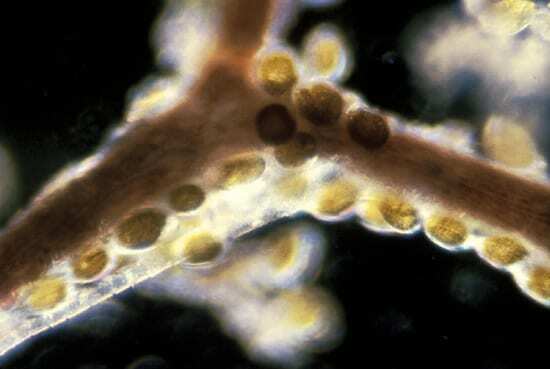 Scientists know the cause: single-celled marine algae called Gambierdiscus living on seaweeds. They produce a substance that is transformed into a toxin when reef fish graze on seaweed and consume the Gambierdiscus cells; larger fish eat the grazing fish, passing the accumulated toxin up the food chain, eventually to people. But scientists don’t yet understand fundamental aspects of how, when, and where various strains of Gambierdiscus grow and live. Funded by the WHOI Ocean Life Institute’s Tropical Research Initiative, a team of researchers launched a study of Gambierdiscus. 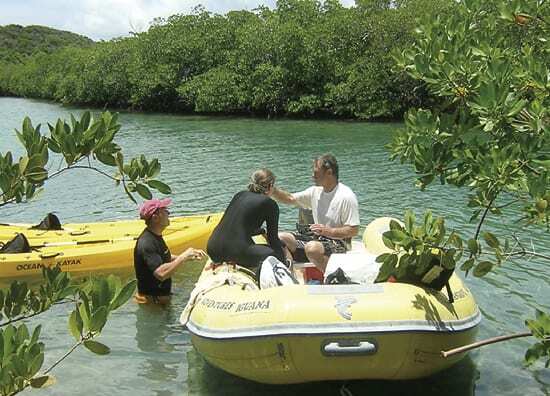 They collected seaweed samples in the U.S. Virgin Islands in 2006 and 2007, bringing them back to the lab to isolate, culture, and analyze algal cells attached to the seaweed. The team—WHOI Senior Scientist Don Anderson; Deana Erdner, a University of Texas marine biologist and former graduate student in Anderson’s lab; and Robert Dickey, a U.S. Food and Drug Administration chemist—plans to map distributions of Gambierdiscus, genetically identify different strains, and analyze their toxins. The study aims to discover how strains and degrees of toxicity vary in different environments. Anderson hopes this pilot study will stimulate funding for research in collaboration with epidemiologists and neuropsychologists who would investigate the human side of the poisoning syndrome.